The idea seemed so simple: connecting students with career opportunities to bridge the gap between high school and the world of work. For some students, that gap doesn’t exist. For others, it is a chasm impossible to span. It was out of the desire to help students reach the other side, and to create a talent pipeline for Idaho’s businesses, that Idaho PTECH (Pathways to Early Career High School) was born. The project started in 2013 and added its first students in 2014, running through 2018. Students learned about themselves through assessments and activities, attended career-focused field trips, participated in professional-style conferences, learned and practiced soft skills, interacted one-on-one with PTECH staff, developed detailed educational plans, and had valuable discussions in real time with a remote coach who helped them navigate the way to their future career. In the beginning, PTECH also provided the use of a laptop for every student and financial support for dual credit courses, until the state’s Fast Forward program expanded to cover that expense in 2016. While PTECH worked with any willing student, its focus was on Idaho’s rural, “middle 50” students — the kids who might not have had any kind of postsecondary plan. PTECH originally focused on three specific, high growth industries where a technical certificate or an applied associate degree could land a student a living-wage job: healthcare, advanced manufacturing/aerospace, and technology. Students were bused from some of Idaho’s remote high schools to businesses, colleges and workforce training centers. Leaving their high school campuses allowed the students to walk through different environments and listen to CEOs explain what their companies produce, how they got their start, what their companies value, and why their businesses are critical for Idaho’s economy. Students saw airplanes being built from start-to-finish. They learned that logs undergo MRI imaging in a high-tech saw mill. They participated in intense coding weekends. Students held human hearts in their hands during cadaver lab tours. In short: students had opportunities they wouldn’t have had without PTECH. During its four-year-run, PTECH enrolled over 800 students and had more than 800 additional students on a waitlist. PTECH worked with more than 30 high schools and over 60 businesses around Idaho. Students want many options while they explore their future, and the more hands-on those options are, the better. Recruiting and retaining students who want to engage in meaningful career planning is tough. Getting them to participate in planned activities can be even harder. Teens have busy schedules and struggle to commit, because they want to keep their options open until the last minute. Also, students don’t always connect the value in how they spend their time now with how it will affect their futures later. Having a school staff member champion a program is essential to foster student engagement. The schools in which an individual staff member actively encouraged PTECH participation saw the most student success; in schools without such a person, students often didn’t see the value in PTECH. The role of a trusted adult as an encourager for a student’s future success should not be underestimated. Schools have so many obligations that adding additional activities can be burdensome for them. Building mutually beneficial relationships with businesses takes time and effort. Businesses are often unsure how to best interact with high school students or what role they should play in the creation of a talent pipeline. Work of this nature comes with a substantial price tag; building a broad base of financial support from multiple sectors proved to be very difficult. The state overhauled its Advanced Opportunities program in 2016, providing significant funding for every Idaho public school student to take meaningful steps toward postsecondary goals. Businesses, often in tandem with the Workforce Development Council, created more on-the-job training programs. Idaho’s registered apprenticeship program continued to grow. The state created the Next Steps website, which continues to add features, including Idaho’s one-step college application, career search engines, scholarship links, and grade-level checklists. It now also hosts Idaho’s Career Information System. The state has provided College & Career Advising funding to all public school districts. The Idaho Digital Learning Alliance (IDLA) is currently working toward the development of an online soft skills course, to be ready for release by January 2020. If Idaho can continue this momentum, by the time our current 15 to 24-year-olds reach the age of 25-34 (the group measured by the state’s goal that 60 percent of the population will have some kind of postsecondary credential by 2025), we will be taking major strides toward its achievement. Maybe, we’ll keep more of our homegrown talent in-state. Maybe, we’ll move away from being known as a state with some of the lowest paying wages in the nation. Maybe, we’ll attract more high-paying industries to a state where the quality of life and work ethic of the people shine. Maybe, just maybe, we’ll be the economic envy of all our border states. Idaho is a great place to live, to raise a family, to work and to retire. Just ask all the people who have moved here from other areas. Those of us whose families have lived here for multiple generations know it, too. We all need to keep working to help students find their way to a living-wage career. We need to encourage Idaho businesses to grow and prosper. 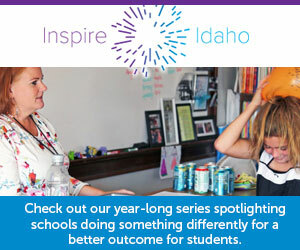 We need to help our school systems as they play their critical role in developing Idaho’s talent pipeline. The idea may have been simple, but the solution is highly complex. Only by working together will we bridge the gap between our high schoolers and their future careers. Written by Stephanie Childress, executive director of Idaho PTECH.